(?) Mary was born in 1824 at Maryland, USA.1 She married Thomas Dillon, son of James Dillon, in 1844.1 Her married name was Mary Dillon. [S151] 1860 U.S. Census, unknown repository address, Schedule 1, Eagle Township, Vinton County, Allensville PO. [S150] 1870 U.S. Census, http://www.denbowtree.org, Schedule 1, Harrison Twp, Vinton County, dwelling # 44, family #44. Rosa May Masters was born on 4 October 1869.1 She was a witness to the fact that Leonard Oliver Masters and Margaret Jane Gilbert were living in 1870 at Allensville, Harrison Twp., Vinton, Ohio, USA.2 Rosa May Masters married John V. Leach on 7 February 1895. Rosa May Masters died on 20 July 1912 at age 42.1 She married William Read on 20 July 1912. Her married name was Leach. Her married name was Read. 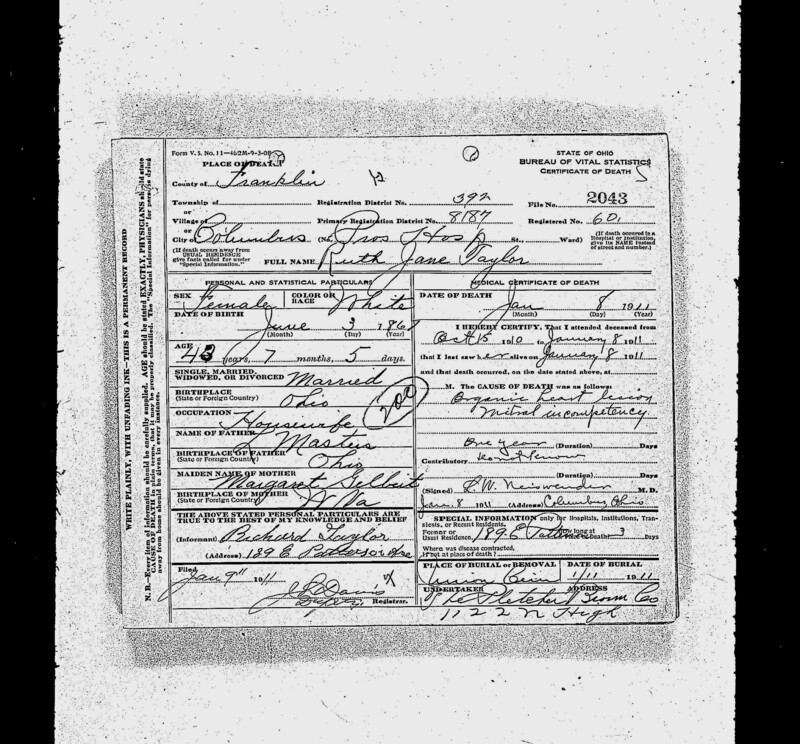 [S134] Ruth Masters Taylor, Death Certificate. Thomas Worland Masters was born on 1 September 1871.1 He married Myrtle Cavin on 5 February 1895. Thomas Worland Masters died on 15 March 1924 at age 52.1 He married Marie Johnson on 15 March 1924. Cline Matthews was born in 1895. He died in 1957. Rayborn Matthews was born on 9 September 1932 at Malakoff, Henderson, Texas, USA. He Reference: Data from son. He died in February 1981 at Athens, Henderson, Texas, USA, at age 48. He was buried on 1 March 1981 at Corsicana, Navarro, Texas, USA. Arvie Henry Maynard was born on 11 July 1873. He died on 6 August 1908 at age 35. James Mc was born in 1877. He married Mary Viola Denbow, daughter of James Tanner Denbow and Sarah Catherine Rose, in 1897. James Mc died in 1910. Maude M. McCollister married John Hartman Sherer, son of Francis M. Sherer and Margaret Jane Henderson, on 22 August 1895. Maude M. McCollister Notes in the Sharp Family Bible kept by Maude Elsie Sherer Sharpstate that Maude McCollister Sherer wife of brother John Sherer diedApril 10, 1951. Her married name was Sherer. She died on 10 April 1951. Harlan McCoy died at Ohio, USA. [S216] Jon H. Livezey and Helene M. Davis, Harford County Marriage Bonds, p. 215. Johanna McDonah was also known as Johanna Gill. Elizabeth McGinnes was born in 1812 at Darke, Ohio, USA.1 She married Robert Devor, son of John Devor and (?) Margaret, on 1 January 1835 at Darke, Ohio, USA. Her married name was Devor. James McGonagle was born on 17 February 1910. He married Dorothy Blanch Reid, daughter of Robert Reid and Bert Penman, in 1934. James McGonagle Places of Residence: Punxsutawney, Pa. Occupation: Printer,Punxsutawney Spirit Newspaper Date of Death may be 27 March 1981. He died on 29 March 1981 at age 71. Mary E. McGurk was born on 25 December 1868. She married William J. Denbow, son of Bazzel Denbow and Ruth Tanner, on 14 June 1899.1 Mary E. McGurk was also known as Sour @C1274@ McGurk. Her married name was Denbow. She died on 31 January 1928 at age 59. James McKee was born in 1835.1 He married Catherine Jane Rush on 7 March 1888 at Darke, Ohio, USA. Francis R. McLain married Elizabeth Hewitt, daughter of Ephriam Hewitt and Mariah Bobo, on 25 August 1865 at Mineral, Athens, Ohio, USA.